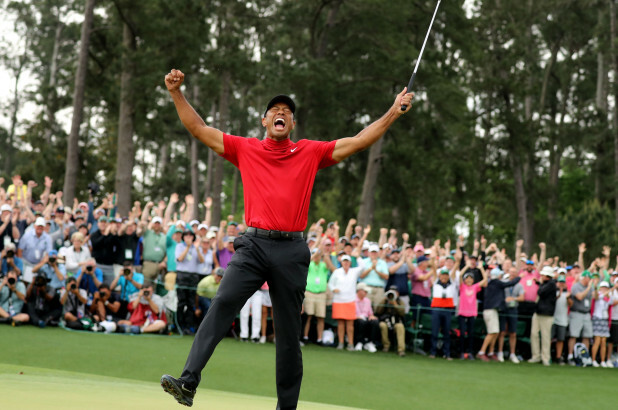 Tiger Woods won his fifth Masters Sunday nearly 11 years after his last major victory in one of the greatest comebacks in the sport’s history. Woods, 43, won the tournament by one stroke in a close competition that at one point saw five golfers sharing of the lead. Things grew even more dramatic when four golfers remained tied with just a few holes left to play, Yahoo Sports reported. Woods’ rivals, some of whom are seen as his successors, all hit disappointing shots in their final holes, with one, Francesco Molinari, sending his ball into the water. With two holes to go, Woods took a two shot lead, and carried things over the finish line with the crowd cheering him on. Fellow athletes also fêted Woods, including tennis superstar Serena Williams, who praised the golfer’s tenacity and his ability to overcome his injuries. This is Woods’ 15th Majors victory and his first Masters since 2005. He won his first Masters at the age of 21, in 1997, simultaneously becoming the youngest golfer and first black man to win the tournament. In recent years, the champion struggled with injuries and personal troubles, leading some to believe his best years were behind him. Those critics have now been silenced.